This year, for the first time, plant novelties may be requested to admission to the competition not only by exhibitors of GREEN IS LIFE. We kindly invite all persons who want to popularize and promote their plants - growers, nurserymen, authors of new varieties. Organized by Polish Nurserymen Association, PLANTS NOVELTIES COMPETITION is a constant event of International Exhibition GREEN IS LIFE (Warsaw, 6-8 September 2018) and only such competition in Poland. Its aim is to extensively promote new, interesting varieties of trees, shrubs, climbers and perennials. So far, the participation in the competition was reserved only for participants of trade (exhibitors). 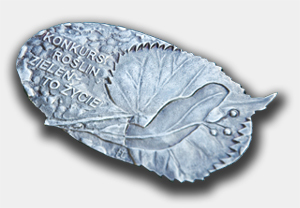 However, this year, the management board of Polish Nurserymen Association for the first time enabled admission of novelties for broader circle of interested parties - breeders, authors of new varieties, growers and nurserymen who do not have to be exhibitors, but they wish to popularize and offer them to the broader circle of recipients. The plants are assessed and awarded by the international jury. The special distinction of journalists has been awarded for 2 years. The participation in the Plant Novelties Competition provides many benefits connected with the promotion of novelties requested to admission and their authors. Portraits of plants are published not only in the exihbition guide, websites of the exhibition https://www.zielentozycie.pl/index.php/en/ , Polish Nurserymen Association https://zszp.pl/en/strona-glowna-en/ and e-catalogue of plants https://www.e-katalogroslin.pl/search/basic but they are also widely promoted in national and international gardening magazines, TV programs and via social media. The winning plant is printed on the cover of Nurserymen Catalogue. Prizes and distinctions are awarded during the inauguration of exhibition in the presence of many journalists. The great location of stand, where the novelties are presented, ensures that most of guests who visit the trade, starts their visit from visiting the competition display. The request to admit varieties to the competition on the basis of the application form, which together with photographs shall be submitted to the office of Polish Nurserymen Association, Al. Jana Pawła II 80 office 71, 00-175 Warsaw or sent via e-mail at: zszp@zszp.pl up to 2nd July 2018 to 23:59. Registration fee for each variety requested to admission amounts to: EUR 140 for exhibitors and EUR 240 for who do not take part in the exhibition. Plants admitted to the competition shall be delivered one day before the opening of the exhibition, i.e. 5 September 2018 up to 12:00 to the office of the trade organizer within the area of exhibition in number from 1 to 10 units depending on the size of plants.